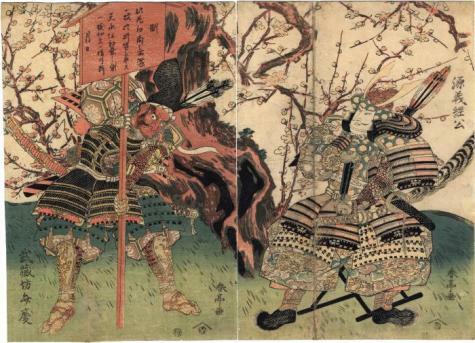 "In this legendary scene, Benkei, the famous warrior-monk of the late twelfth century, plants a signboard in front of a gnarled plum tree at Daimotsu Bay by order of his master, Minamoto no Yoshitsune. Based on an edict issued in the Ten'ei period (1110-1112) for a famous maple tree, the sign reads... 'If you break off one branch of this tree, one of your fingers will be cut off.' The date on the sign, Ju'ei 3 (1184), marks the beginning of the Gempei wars, and the year Yoshitsune and the Minamoto troops defeated the Taira at the decisive battle of Ichinotani." Quoted from: Jewels of Japanese Printmaking: Surimono of the Bunka-Bunsei Era 1804-1830, by Joan B. Mirviss, p. 98.